NEWINGTON - Back to Motion Rehab & Fitness doesn’t just offer clients chiropractic care and therapy to recover from an injury. From personal training, to nutritional training, to mindfulness and yoga, Dr. Alexa Veeder and Dr. Brad Visconti can make sure that clients are moving and improving. Both Veeder and Visconti are chiropractors who can design a personalized treatment plan and personal workout plan for clients to get back on track after an injury, surgery or if they just want to feel healthier. Back to Motion also provides treatment for degenerative spine issues, herniated disks and sports injuries. The goal is to get people not only back on their feet, but also exercising so they can maintain and improve their health. Veeder said there are misconceptions about what chiropractors do. In addition to standard chiropractic treatments, Back to Motion offers a full range of fitness and wellness programs including group fitness classes, personal training, yoga, nutritional training, mindfulness programs and marathon training - provided by Veeder who is an experienced marathoner. They also offer speed and agility training to help athletes on the field. But they can also help everyday active individuals remain injury free with workouts that suit any ability level designed to improve performance and maintain health. “It’s important to keep your muscles healthy and your spine strong,” Veeder said. She suggests at least 30 minutes of exercise a day whether it’s walking, hiking, biking or going to the gym. 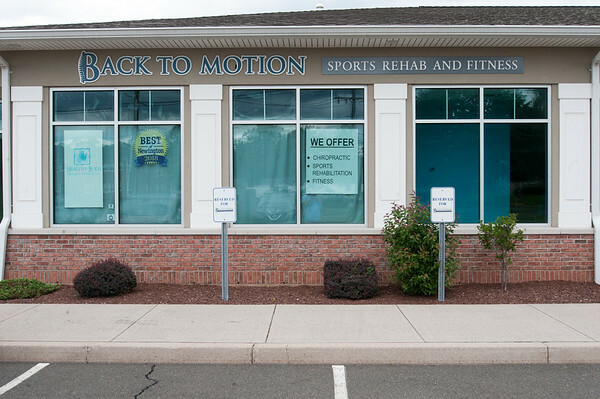 For more information on Back to Motion Rehab & Fitness located at 465 Willard Avenue, call 860-665-0826 or visit their website at btmrehabfitness.com. Posted in New Britain Herald, Business, on Tuesday, 4 September 2018 19:06. Updated: Tuesday, 4 September 2018 19:09.